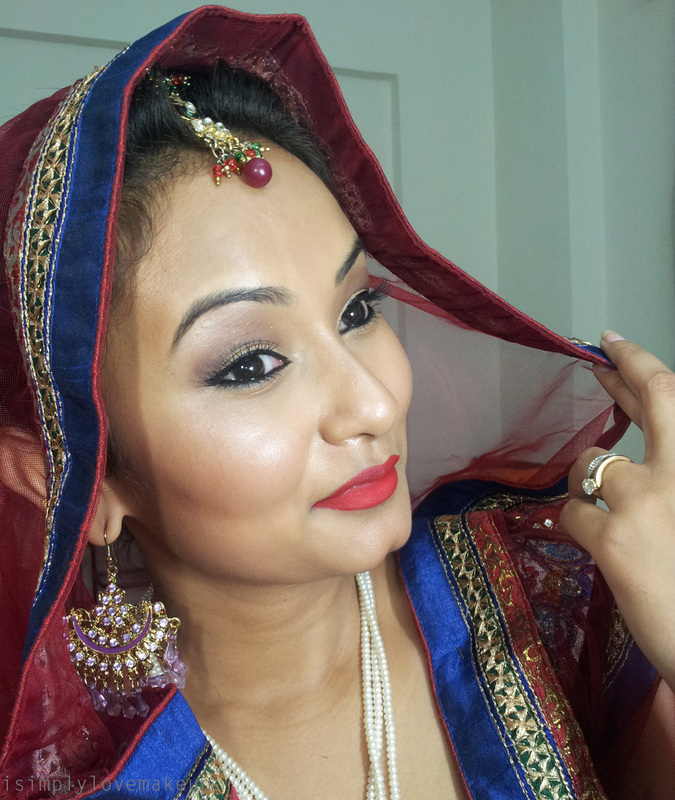 Today, I have done a makeup look that would be apt for a late evening/night ceremony. 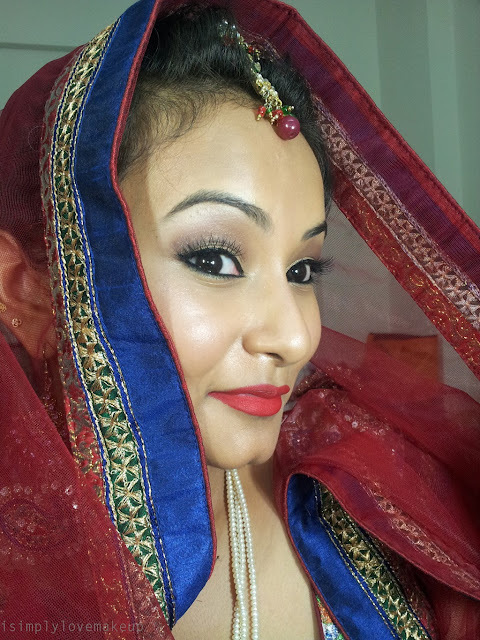 All decked up in major BLING and a bright Red dupatta, I chose to match my lips with my lehenga and leave the rest a little understated. 1. Cut-crease look to make my partial hooded eyes a little defined. 2. Winged liner to elongate my eyes. 1. You need to get your base right. Especially if you are having a late evening ceremony, it is best to get a good concealer and a heavy coverage foundation. 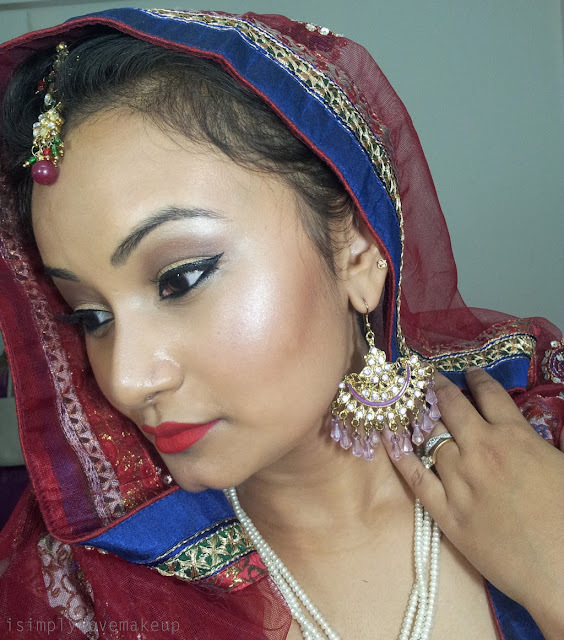 Nighttime ceremonies means a lot of harsh lighting and hence your skin needs to look flawless. 2. Always and always opt for a liquid foundation. 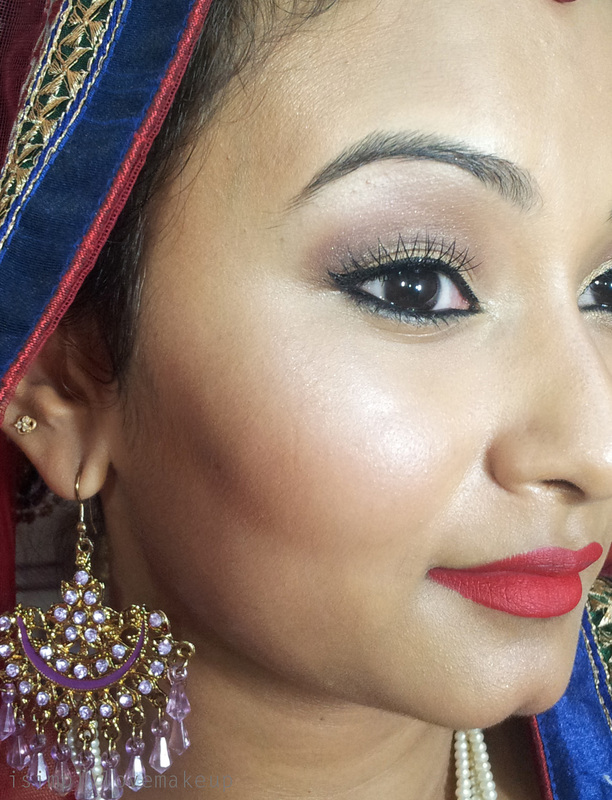 Powder and Cream Compact foundations (such as MAC Mineralize & Maxfactor's) are not a good idea for evening weddings. Even if you have oily skin, you should get yourself a liquid foundation meant for oily skin. 3. Under your concealer and foundation, you need to apply a good and a resilient primer that will not only help your makeup stay in place but will also prevent your foundation from oxidizing and turning orange. Yes it happens, especially if you are under a lot of stress! 4. Its imperative to mention that you must powder your face once you've applied your base makeup. This not only keeps the shine in control but also gives that finish to your makeup and makes it look all professional and complete. 5. Remember to get your face bleached a couple of days prior in order to make all kinds of facial hair invisible. Of course, threading of your eyebrows and upper lip are mandatory if you want your foundation to set properly. 6. Oh and stay away from foundations that contain SPF. They give a whitish cast under flash photography. 1. First and foremost, you ned to have your eyebrows groomed... Come what may... If you want to look sharp and your pictures to come out well, your eyebrows need to be tamed, filled-in and shaped... Trust me when I say it makes a major difference to the final outcome. If you are dying to do a Smokey Eye cause you think it would totally transform you into a hottie, then I'd suggest you to do it for your reception rather than the wedding ceremony. 3. 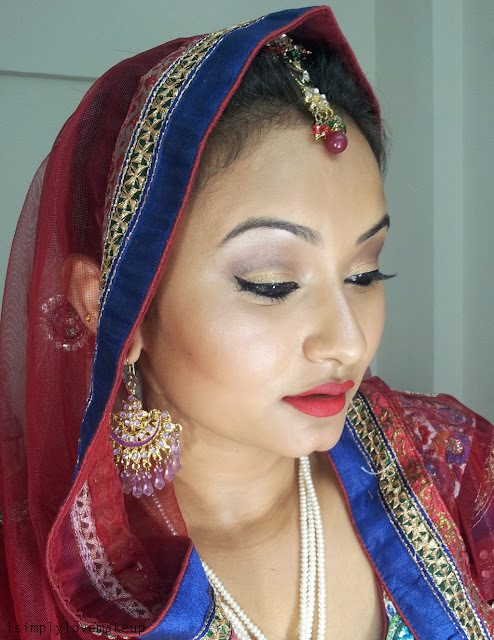 Most of our bridal attires either have golden (bright, coppery, antiqued, dull) or silver work and hence you may want to use a similar shaded eye shadow for your eyes but remember to use it only on your lids. The shimmery eye shadows should not cross the crease of your eye. Also note that when I say a complementing colour, I mean a shade that looks good with the primary color of your outfit... For example, if your lehenga/saree is Red, then a navy blue matte shade in your crease could do wonders... If your lehenga/saree is Pink/Magenta/Fuschia then an emerald green matte eyeshadow in your crease would look gorgeous... You get the drift don't you? 7. 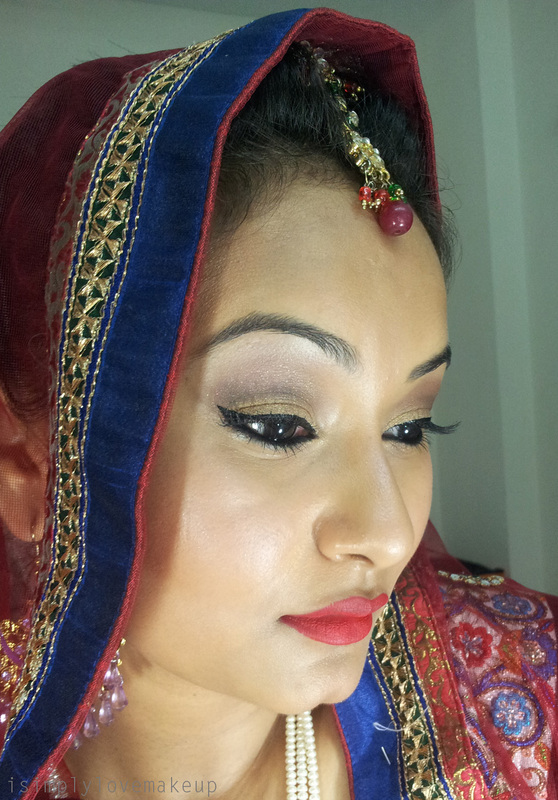 Use loads of waterproof mascara and stay away from false eye lashes for the wedding ceremony... The eyelash glue melts away in the heat radiating from the havan. 8. Do go in for a winged liner as it looks extremely womanly, graceful and beautiful. 1. Since, the eyes have been done up to not match our outfit, I'd suggest you to match your lipstick to your outfit to being as close as possible. 2. Keep your lipstick preferably matte and do the tissue trick to keep in on for long hours... The trick is to wear an opaque shaded lipstick and then kiss into a tissue, reapply the lippy and re-kiss into a tissue... Do this three times and your lippy should stay in place for the rest of the night. 3. If your lippy seems too matte or too severe, then apply a little bit of a transparent gloss in the middle of your lips and press your lips together. That's it! Don't apply the gloss all over your lips! 4. Oh yeah before I forget, getting your upperlips done is not optional but mandatory! Seriously! 1. 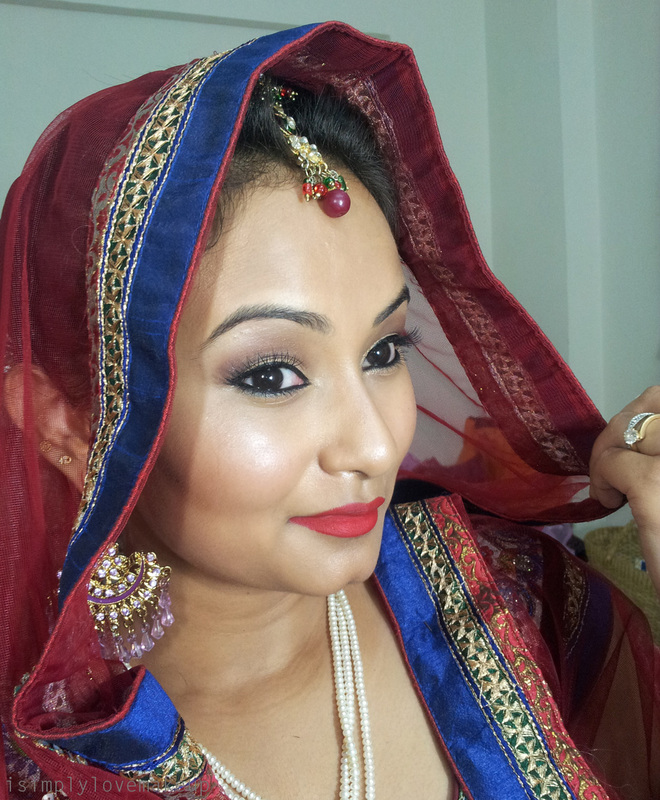 If you are getting married ay night, then you need to contour baby... Cause if done correctly, then it looks really fabulous in the pictures. It does. 2. You will need to use a lowlighter in the hollows of your cheeks, on your temples and under the jaw bone. This gives angles to your face and makes you look thinner and sharper. 3. Use a highlighter on your cheekbones, the bridge of your nose, forehead and on your cupid's bow. 4. A nice rosy or a pinky blush is mandatory. Without it the harsh lighting will wash you out in the pictures. 5. For an iridescent glow, you could apply a cream blush first and then apply a layer of powder blush on top of it. This gives the face a glow and the layering ensures that the blush stays on longer. Please note that this a 2 part post. This was part 1... Part 2 will be about the stuff that I may have missed out or about stuff that you may want to cover in addition to the points I have listed out here. Love love love this look Sam .. U look stunning that matte Red lips are extraordnary and cut-crease eye makeup is just wooww!! I wan tto have a glimpse at your lehenga.. it looks so prettyy!! U manage to look great with every kind of makeup.. This is incredibly beautiful and HOTT. Woosh!